much love, illy: some crazy weeks call for this. mickey-dee runs, especially when they build a 2 story one in your itty-bitty town (the only other place i've seen a 2-story mickey dee's was in chicago!). 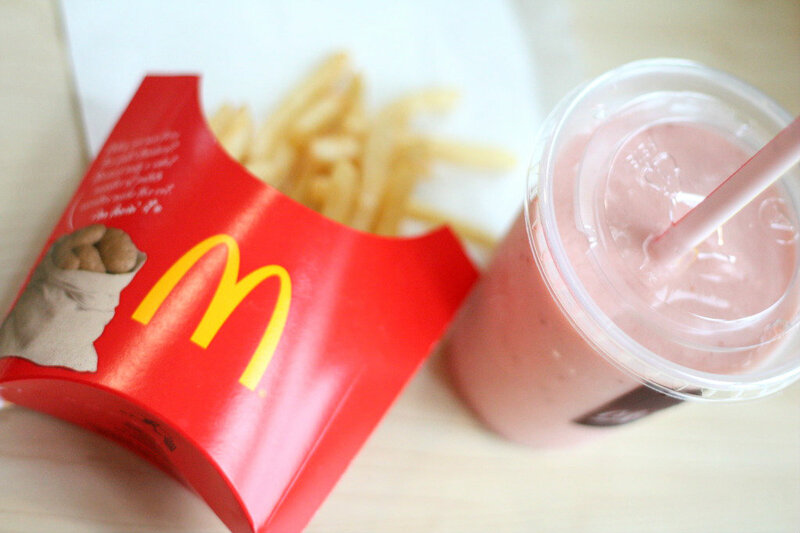 strawberry banana smoothie plus medium order of hot, salt fries equals absolute best. 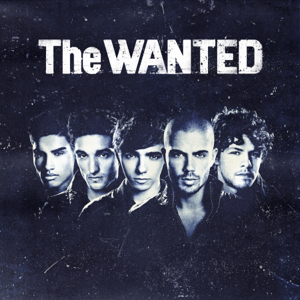 listen to The Wanted on repeat over and over and over again. especially Lightening and All Time Low. and of course, you all know i'm already obsessed with Glad You Came. 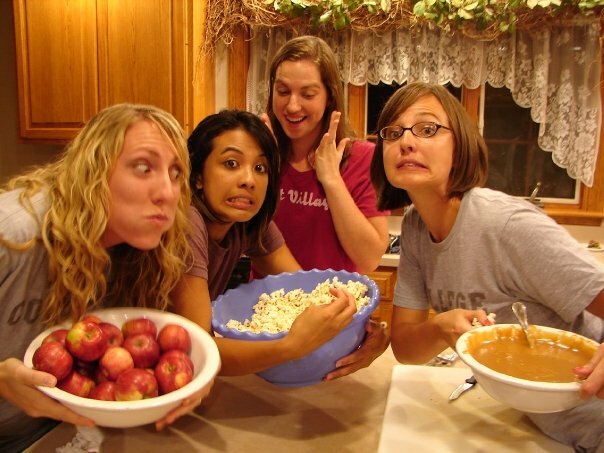 senior year of college, 2006. i liked popcorn back then, too. and why is it when you are most busiest that you find yourself flipping through old photos on facebook or on your laptop? found this one this week and can't stop cracking up. good times. what do you do when life gets a little caaaa-razy for you? p.s. two sweet giveaways happening here and here! and this weekend i'm hanging out over at with my friend, Dana over at her part of blog world, The Wonder Forest. she is having a haaa-uge link-up party so be sure to check back here Saturday morning so you can join in! AND are you Barb C (#7) 'cause you just won the NS Pottery giveaway! shoot me an email at muchloveilly at gmail dot com to claim your prize! congrats to Barb and thank YOU, NS Pottery for a fantastic giveaway! Oh my goodness, I haven't had Micky D's in a very long time! I'm currently craving! ooooh i'm a sucker for mcd's fries after a stressful week. that and oreo mcflurries. When things get crazy for me I really like to blow off steam with my gfs, go out and go wild. Else curl up in a hot bath with a good book. well...i give you credit for controlling yourself...i just split a 20 piece nugget with a friend...AND had fries. my tummy is yelling at me now...! Sometimes McDonald's just totally hits the spot. Those fries look heavenly! 1. Warzone is my fav by them! 2. Love Mickey D's once in a while but during the move we had it 3 nights in a row for dinner. blegh! 3. Love Dana...can't wait to see whats in store! Is it weird that everytime I think about McDonalds, eat it, or have a craving for it that I want to tell you? You have invaded my life!!!! oh how i LOVE bringing back old photos!! sooo fun!! i had that exact combo sunday after church! SO delish! those fries look so yummy! i'm thinking they might be in my future....as in tonight!! Do you have any pictures of us on 4N in 2005? I'd love to see some...if you ever run across some good ones! (Ross's house weekend, the floor ministry team meetings, mr. moody?, what about the amazing open houses the Dryer 1 guys did...) love you! Nothing hits the spot quite like Mc Donalds chips fact! I'm practically running to McDonalds right now! ha! You HAVE GOT to try the mango pineapple smoothie from McDonalds! YUM!!! And I will now be sending the hubs out for a shake! Lightning is getting some heavy rotation on my iPod! I am definitely a McDonald's girl if I'm feeling Stresstown USA. GOOD CALL, Illy! I have NEVER seen a two story McD's. I didn't even know they existed. I'm going to have to be on a mission to find one now. 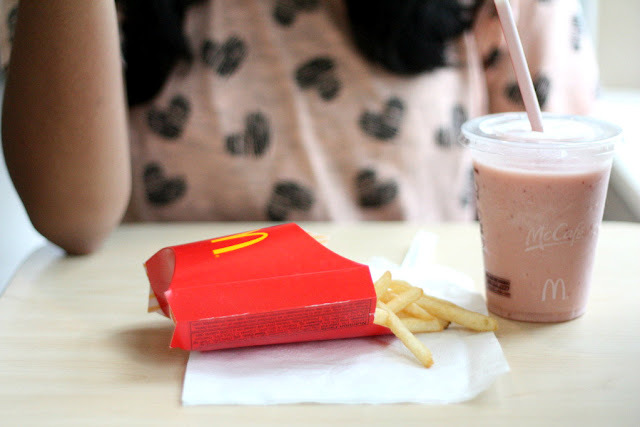 However, tomorrow I might make a mission to our dinky McD's because those smoothie and fries look yummy. I downloaded a lot of new music recently... Gotye, fun., Marina & the Diamonds, and Ellie Goulding. I should definitely get The Wanted too!